Today the press revealed a man who has purchased at least 1,700 wild horses from the Bureau of Land Management’s (BLM) Wild Horse and Burro Program for $10 a piece. Dave Phillips reports in ProPublica, All the missing horses: What happened to the wild horses Tom Davis bought from the government? It appears that the BLM is selling healthy indigenous wild horses to a known pro-slaughter kill-buyer to dispose of our living legends. Here are some articles providing some background about the BLM’s heinous wild horse traffic to slaughter . . . America’s living legends, betrayed by those entrusted to protect them under the 1971 Free Roaming Wild Horse and Burro Protection Act. The agency’s mission changed in December, when Congress passed a bill that made it legal for the BLM to sell wild horses outright . . . Since December the BLM has sold about a thousand wild horses under the new rules. The slaughtered horses were originally sold to the Rosebud Sioux Indians in South Dakota and to an unnamed Oklahoma man who said he wanted the horses for a church youth program. The Sioux group bought 105 wild horses at a dollar apiece, then traded 87 of them to a horse broker, who sold some of the horses for slaughter. The Oklahoma man bought six at $50 apiece, according to the BLM. Slaughterhouses are known to pay hundreds of dollars for a horse. Now, a law signed by President Bush will allow the slaughter and export of horse meat form thousands of wild horses. Horse lovers are urgins reversal of the measure, which slipped into a recent federal appropriations bill by Sen. Conrad Burns, R-Mont. 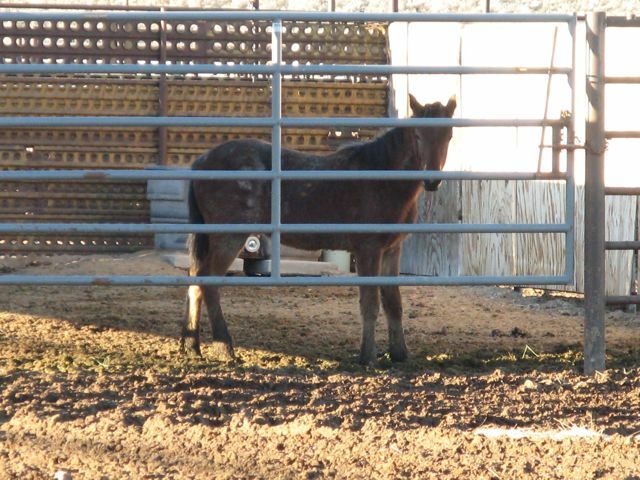 WASHINTON–Wild horses put up for adoption by the Bureau of Land Management continue to be slaughtered, in some cases within weeks of he owner gaining title to the animal, according to the latest BLM records. The quick turnaround has critics questioning how aggressively BLM is enforcing a rule requiring adopters to swear that they don’t plan to sell the horse to slaughter. ‘Not only is the BLM not actually prosecuting people, but they’re not even doing the investigation to try to figure it out and it seems like they don’t want to know,’ said Howard Crystal, an attorney for the Fund for Animals, whose lawsuit led to the no-slaughter clause. A multimillion-dollar federal program created to save the lives of wild horses instead is channeling them by the thousands to slaughterhouses where they are chopped into cuts of meat. Among those profiting from the slaughter are employees of the Bureau of Land Management, the federal agency that administers the program. HELENA — The Bureau of Land Management has been shipping hundreds of horses to Montana ranchers under the government’s “adopt-a-horse” program, and some are going to slaughter, one of the ranchers says. Hundreds of other wild horses have been shipped to South Dakota, mostly to Indian reservations . . .
Federal authorities are investigating a blood-soaked cliffside in the high, remote mountains of southeastern Idaho where officials say a herd of about 60 wild horses was apparently rounded up and sold for slaughter. Despite our requests to be informed about events and press releases, such as the upcoming public hearing scheduled the morning after Memorial Day Weekend in Carson City—we only heard about it Friday evening from an article posted in the Mesquite News online. Some other members of the public who would like to comment heard about it through us this weekend on several social media channels and via email. We are concerned about the agency’s lack of transparency evident in your lack of notification for public hearings regarding the use of helicopters and motor vehicles for potential roundups and management of wild horses. We found your original press release that was dated Friday, May 18th. It only gives the public one business week’s notice. The press release is inadequate notification for the public and from what we see, only the Mesquite News published it online. We have heard from several people who live in Carson City who knew nothing about this important hearing—let alone those living in New York City. Since 80% of the federally protected wild horses and burros remain in Nevada, the whole country should be given ample notice to participate in the public hearing. We kindly request you hold this important public hearing about the use of helicopters and motorized vehicles for roundups and management of wild horses and burros with a standard 30 days notice once you have published it. Please publicize it well so the public will feel you are being transparent. Right now it looks as if you are not. We ask you to honor the opinions of the public (stakeholders) and not be swayed by lobbying or big business. We are concerned the BLM sees the public hearing as a legal formality in order to be allowed to go forward with helicopter roundups, etc. The requirement for the public hearing was set in place to protect the public’s wishes and this must not be ignored.